The Steven Gerrard backlash: is he the new Frank Lampard? If you paraphrase Benitez’s explanation for the substitution, then one could argue that Rafa concurs with our ‘headless chicken’ definition of Gerrard. Benitez said: ‘In this game, sometimes you need to play with the brain and we were playing with heart. We needed to keep the ball and pass the ball.’ Does that mean Liverpool’s manager thinks his star player is brainless? Based on that quote, you’d have to say ‘yes’. Does all this mean the anti-Stevie G bandwagon is filling up? I have always thought it immensely unfair that Frank Lampard is routinely villified and Gerrard is revered. If you remember, your average football fan used to like Lampard. That stopped sometime after Euro 2004, and then the ‘Fat Frank’ tag started cropping up more and more often. Then Lampard had the audacity to win second place in some World Player of the Year poll (sandwiched between Ronaldinho and Samuel Eto’o, as I recall), and then the backlash really began in earnest. Lampard has played poorly for England in the last couple of years, but then so has Gerrard. Lampard may be more precious, more of a nouveau Chelski chav, and generally more annoying than Gerrard, but the Liverpool captain has some traits that bug me, not least his tendency to bully refs into giving cards (see Tony Hibbert on Saturday) and his penchant for ugly, two-footed tackles. I think Rafa’s comments are justified, his heart is always going rule his head in a match like that (the Merseyside derby). However to suggest that means that Rafa thinks he is brainless is probably taking it a little to far. He hasn’t played very well recently, and most players (English or not) go through patches of poor form (Lampard) included. I don’t think Gerrard is faultless either, but he is certainly the best midfielder england has to offer… and as for the rubbish about the cards I suggest we all take a good long look at John Terry for an example of how gentle Gerrards protests are in comparison. There is no need imo to find a scapegoat for Englands performances…. I don’t think Gerrard is the cause of the issues in that team… The management is. Thx for your measured comment Nicko. I largely agree with you. Try telling that to certain reactionary people (a lot of whom frequent this site) about Lampard. Since when is the name “Lampard” a dirty word? Since when is a player measured in the “Lampard-scale” for his performance? Frankie Lampard has offered much to club and country and is a good player. So is Stevie Gerrard, if not better.What the press and the fans do is so frustrating! Putting players up on pedestals, worshiping them as if they have the power to give sight to the blind or walk on water, and should they have a bad game, they bring them down with a deafening crash. I guess it’s what little men do to feel big and important. As for Benitez taking Gerrard off, it was a big mistake! He played with his heart,true, but that’s not to say he played badly. It was Sissoko who kept giving the ball away and making all the wrong passes. Gerrard tried to keep the midfield together and pass to strikers but he was on his own out there. This is more about Benitez wanting to teach Gerrard a lesson for speaking his mind and offering suggestions on game strategy and player selections. They’ve butted heads over this before and I think Benitez has gone too far. The captain has the right to speak his mind and he should be heard and respected. He’s not some insignificant young upstart; he’s the heart of Liverpool and no matter what he does, Benitez shouldn’t be allowed to rip it out. There is no team in the world who wouldn’t be interested in having Steven Gerrard on their roster were he to leave Liverpool, but he chose to stay at his hometown club. 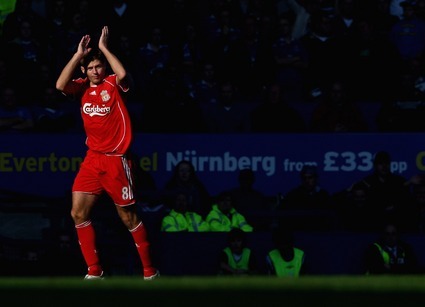 He’s a highly skilled player, whose fiery passion is only surpassed by his fierce loyalty both to Liverpool and England. Where is the fans’ loyalty to their captain when he needs it the most? And when did Frank Lampard become synonymous to “fat” and “failure”? For shame! Should get you guys a jump to conclusions map. People are going way overboard on this whole Stevie G. mess. First off, I’m not sure how healthy he is. He broke his toe and was back in action lickity split, mostly because both Liverpool (lacking Agger and Xabi) and England (lacking wins) needed him. Maybe he’s trying to overcompensate and is pressing too hard. That can certainly explain the missed sitter and why he was all heart in the Derby. He’ll get his head straight when he returns to being comfortable. I just hope that’s sooner than later. Lets make something very clear: NO ONE IS BIGGER THAN THE CLUB. That includes Steven Gerrard. He has been poor over the last few weeks. The manager has every right to sub him whenever he wants!